Item # 311287 Stash Points: 2,999 (?) This is the number of points you get in The Zumiez Stash for purchasing this item. Stash points are redeemable for exclusive rewards only available to Zumiez Stash members. To redeem your points check out the rewards catalog on thestash.zumiez.com. Get an edgy and flirty new look with the Civil Striped Black, White and Yellow Long Sleeve Crop T-Shirt. This loudly patterned crop-style fit features embroidered text detailing across the chest in yellow and blue for a colorful and textured look. Additionally accented with a yellow collar, this loud long sleeve will certainly draw some attention. 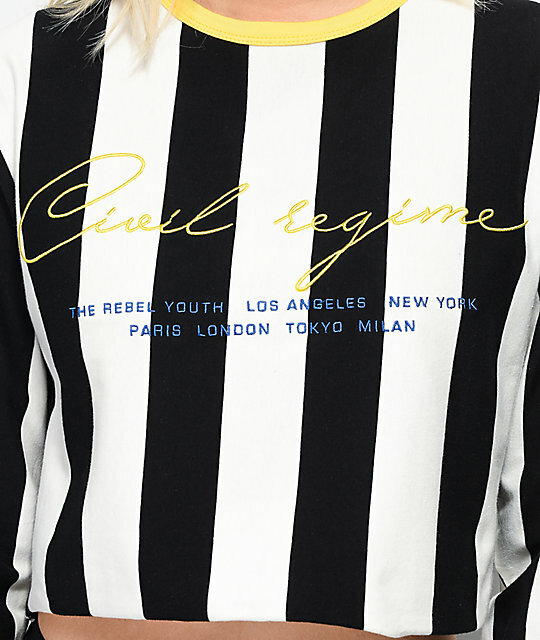 Striped Black, White and Yellow Long Sleeve Crop T-Shirt from Civil. Black and white stripe design throughout with a yellow collar. Emboidered logo script across chest in blue and yellow.